I promise, I will eventually get to the cooking part of the segment, but first Baseball! And baseball has its foods. Hotdogs of course. 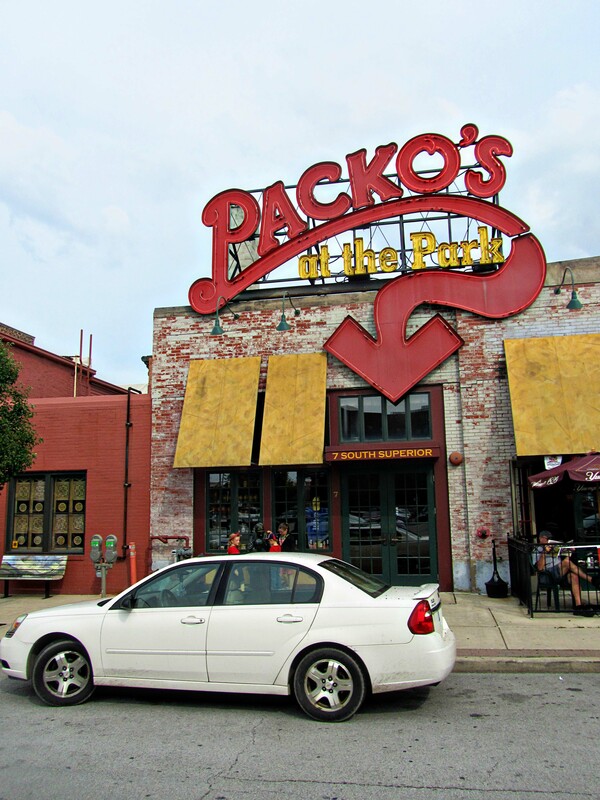 Now if you want a great hotdog, you need to go to Tony Packos in Toledo, Ohio. 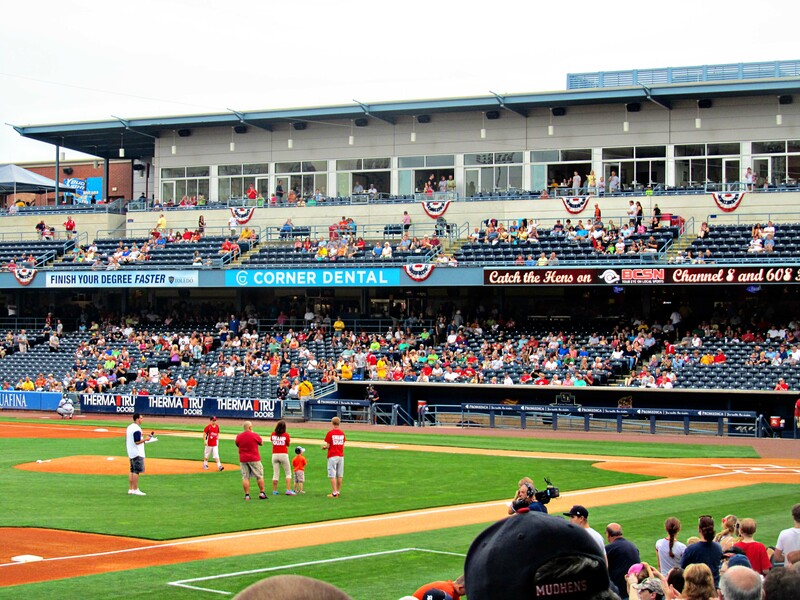 This is the Mud Hen’s field–they are Toledo’s minor league team. 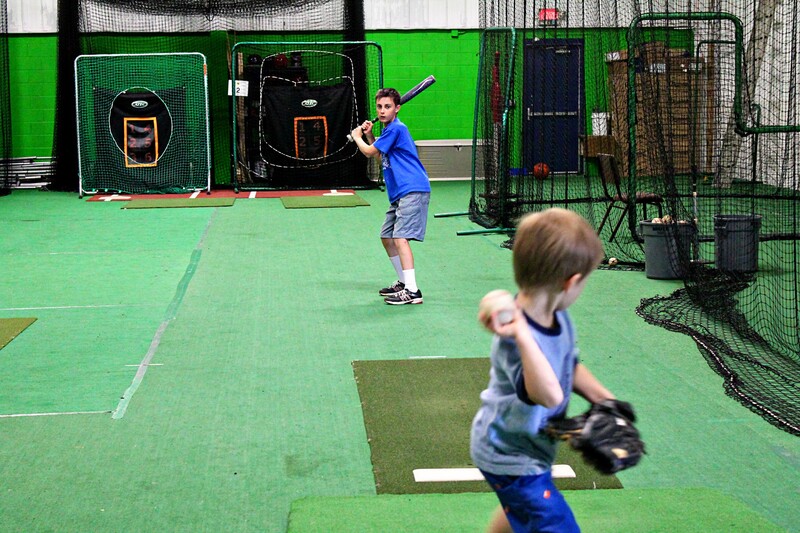 Minor games are WAY more fun than major games, and Bill Veeck tells us why, “I have discovered in twenty years of moving around a ball park, that the knowledge of the game is usually in inverse proportion to the price of the seats. Now baseball has its own language. I mean, why would a bad pitch be called a “ball”? How is a ball that is “in” suddenly be called “out” when it is caught infield? And why is baseball the only sport where the term “foul” refers to a ball going out-of-bounds while in all other sports it refers to player’s conduct? And just when you’ve mastered the 100 different terms used to describe a hit, there is the whole sign language thing to learn. Coaches and catchers have mastered secret hand signals over the years. Hand signals have been attributed to several different players, two of which were deaf. “Dummy Hoy” , and “Ed Dundon“, and have been perfected and mastered over the years. Now you won’t find a YouTube link to help you decipher the coach’s hand signals, because they are secret, specific to each team, and ever changing! 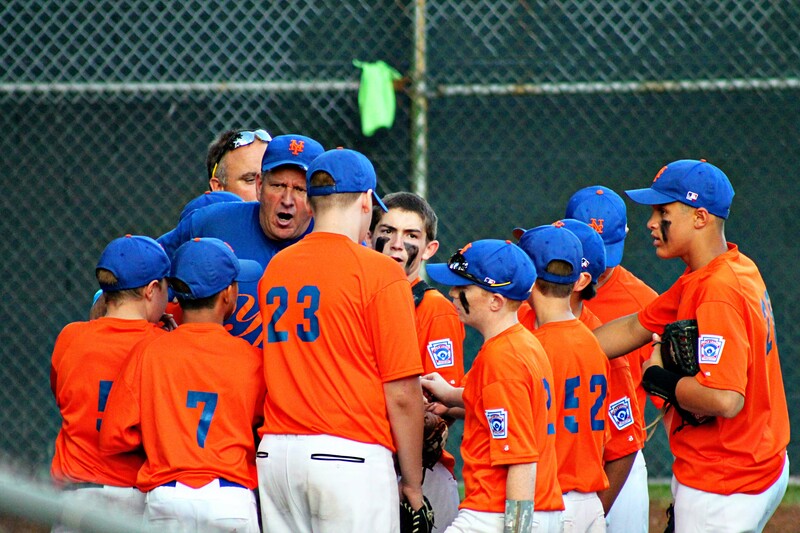 The point is to talk to your players without the opposing team knowing what is being said. Sometimes there is an “indicator signal”. An indicator signal is to let the player know when the real message is being given. For example, if the Indicator is when the coach touches his ball cap, all signals given before then are garbage–meant to confuse the opposing team. And in this world of baseball there are songs. 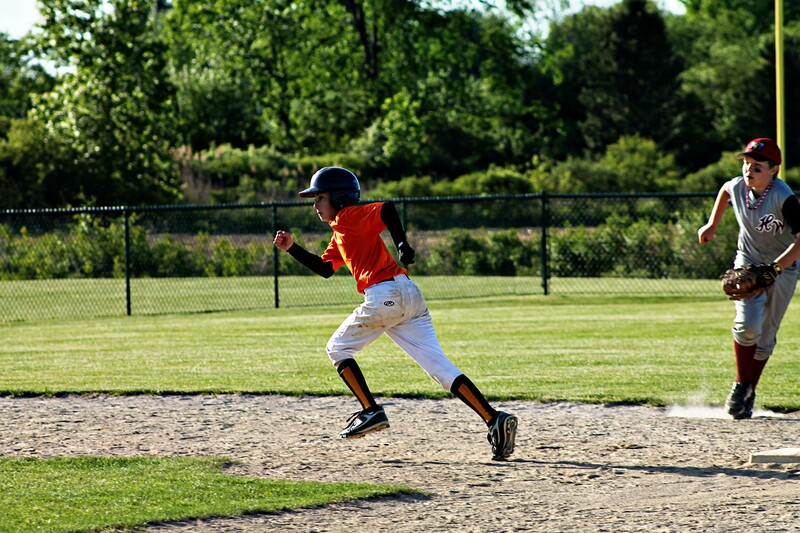 My blood pressure is sky high when my son bats, and my stomach is all nervous. This problem is helped by snacking. 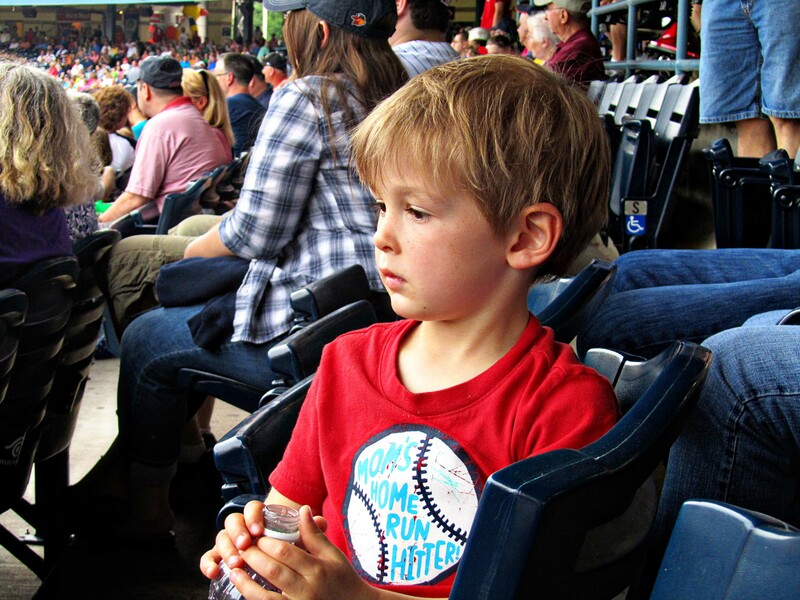 Baseball players chew gum or sunflowers seeds (And only rarely “tobacco” since the 1990’s–thanks to a ban in 1993 in the Minors, though not the Majors). So let’s make this All-American Baseball Snack. 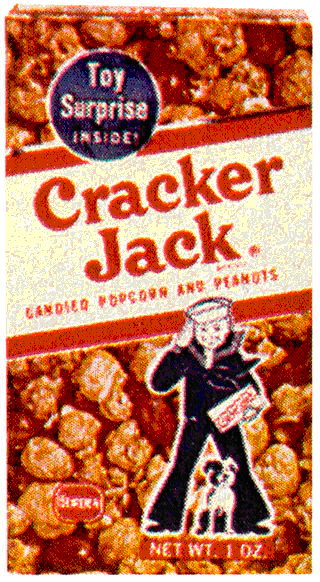 Cracker Jacks is a brand name for Carmel Corn. And since corn is an All-American food it is altogether fitting and proper that it should be the base for an All-American snack for an All-American Game. Start by popping up some popcorn. 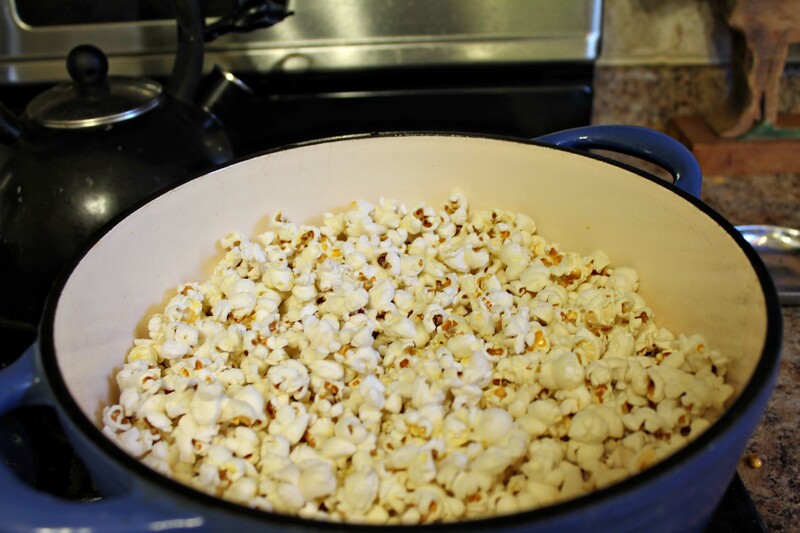 I still pop my popcorn on the stove since I can control the amount of salt and butter added, but any type of popped corn will work. Once the corn is popped. . .
Pour all the popped corn into a brown paper bag. Now we can start on the caramel. A “caramel” is really a melted (and slightly burnt) sugar. Instead of melting sugar down to a liquid, we can also just use liquid sweeteners like corn syrup or molasses. 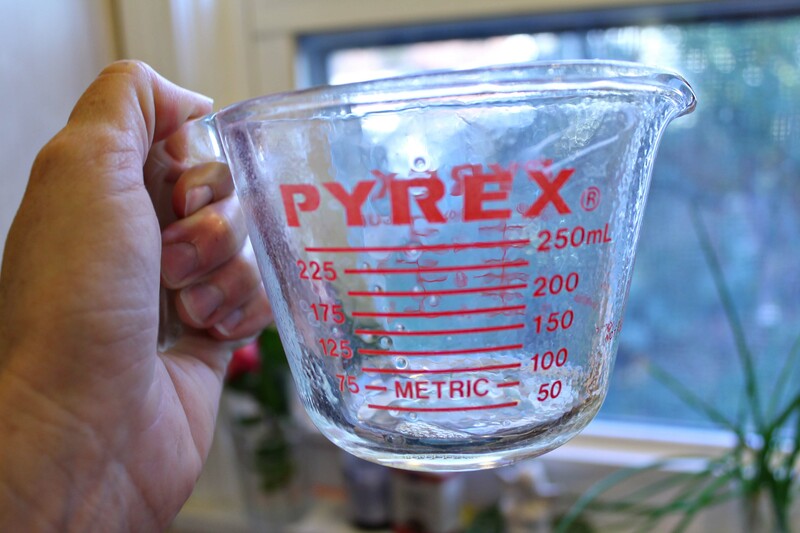 Measuring sticky sugars is a cinch if you spray your liquid measuring cup with spray oil first. 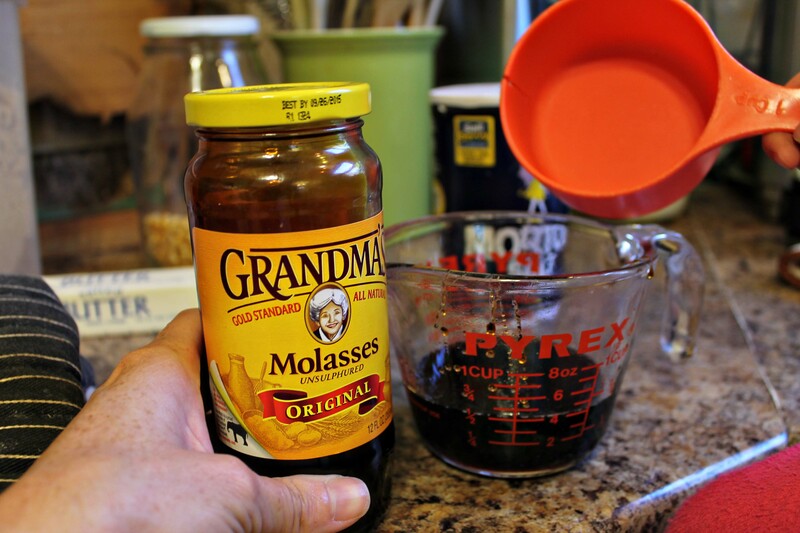 I had molasses on hand, so I used it. But the original recipe calls for “Dark Karo” which is a mid-west term for dark corn syrup. “Karo” isn’t the only mid-west word in my handwritten copy. I have been making this recipe since I was a teen. My cousin Joanna gave it to me and her handwritten copy uses the word “oleo”–such a great 80’s word! Oleo is margarine for you folks born after the 80’s. Now I use butter. 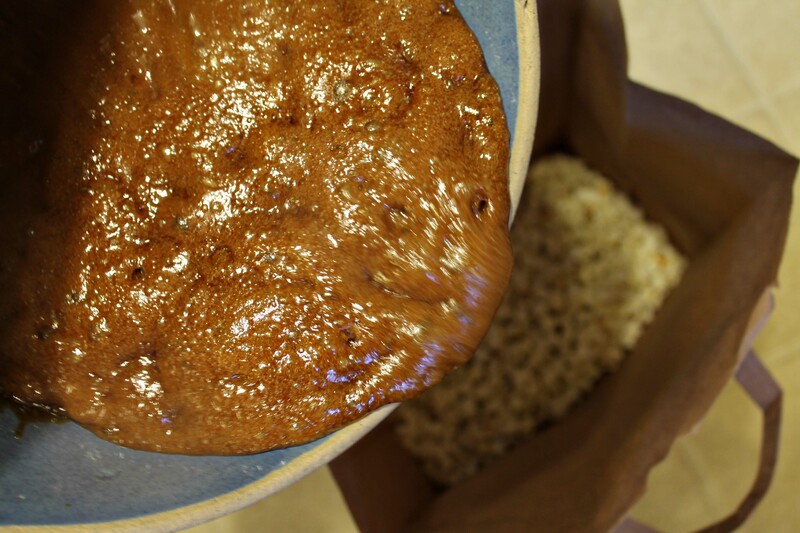 Here’s the ingredient list for Microwave Caramel Corn: 1 gallon of popped corn, 1/4 cup dark Karo, 1 cup brown sugar, 8 T. oleo (or butter), 1/4 t. salt, and one more SECRET INGREDIENT! Put all these ingredients into a microwave safe bowl, and microwave on high for 1 minute. Then stir. Microwave on high for 2 minutes. Then stir. Microwave for 2 more minutes, and stir again. Now we are ready for the secret ingredient. . .
. . .1/4 teaspoon of baking soda. YOUR CARMEL CORN WILL NOT TURN OUT IF YOU DON’T ADD THE SODA. It is easy to forget to add the soda. I know. 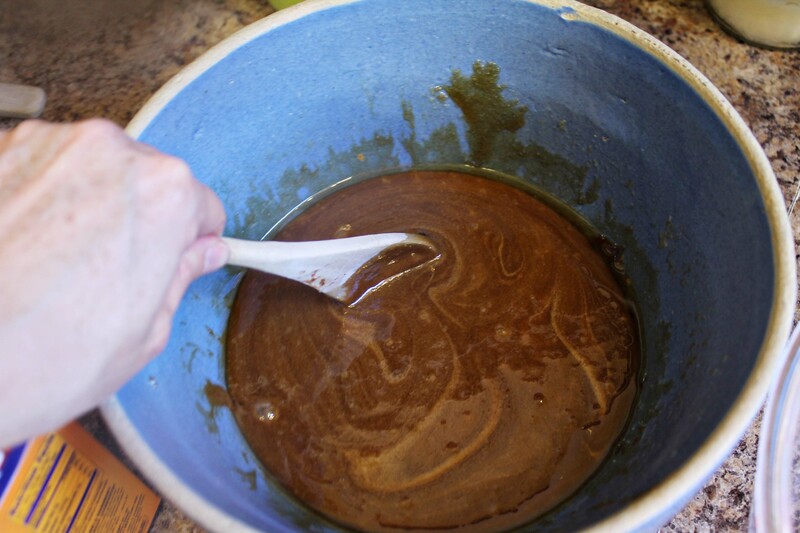 This is what the caramel sauce will look like before adding the baking soda. And this is what the caramel sauce looks like after adding the baking soda. 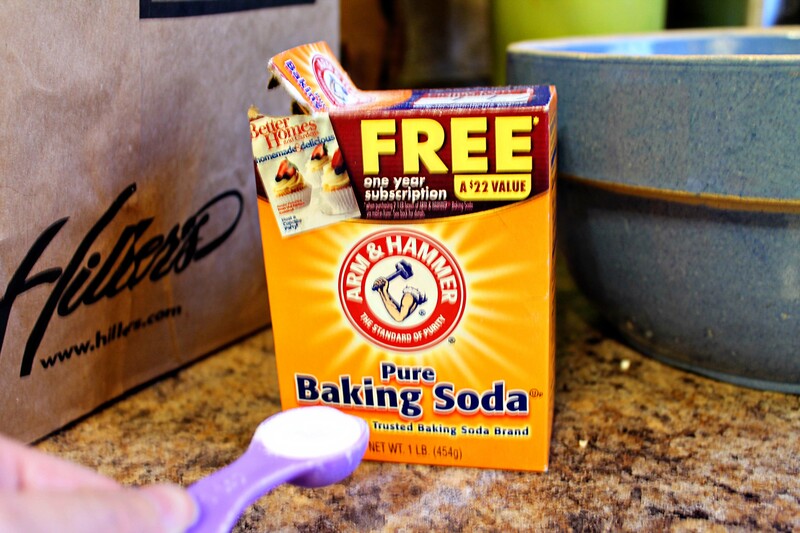 The baking soda causes the sauce to foam up and get lighter. Now I have searched the web, but I can’t find out why baking soda reacts with the sugars ( in our case molasses and brown sugar). 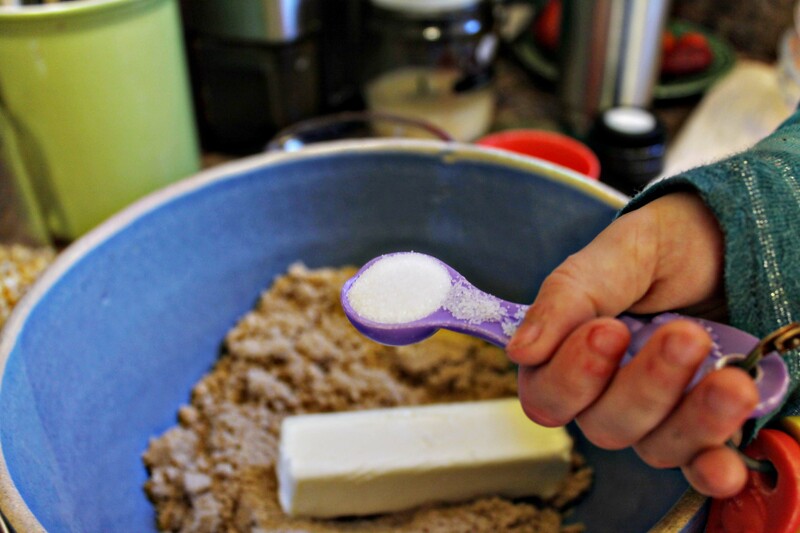 I do know that without the baking soda, you will have a ooey-gooey mess on your hands. The baking soda seems to help set the caramel sauce. I would love any information on what is happening with the baking soda. I know it is reacting, but with what? and why? 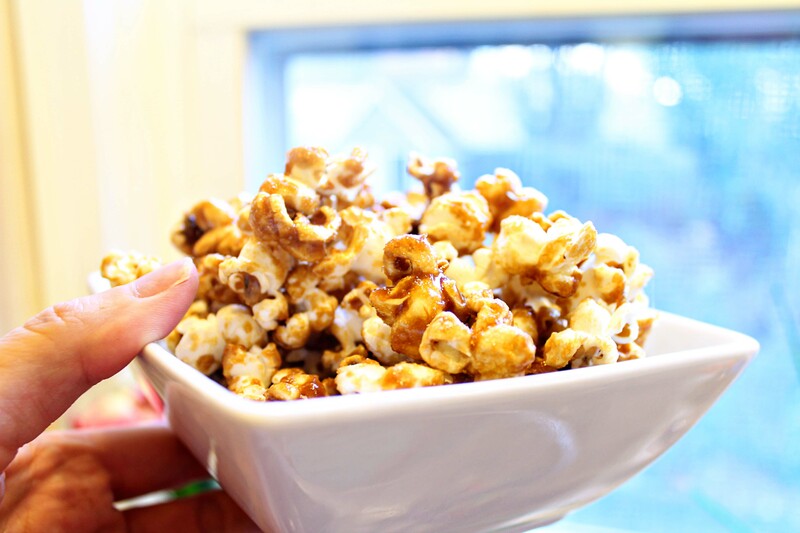 Pour the hot caramel sauce over the popped corn in the brown paper bag. You do not need to shake the bag or mix the popcorn. Just leave it alone. Roll the bag down (Careful caramel sauce is VERY hot!) and place in the microwave again. 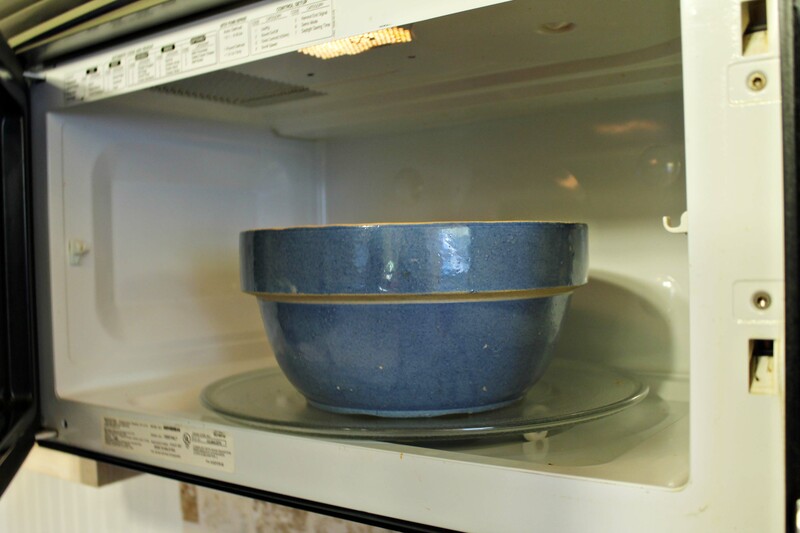 Microwave on high for 1 and 1/2 minutes. Then remove the bag and carefully shake all the popcorn around. 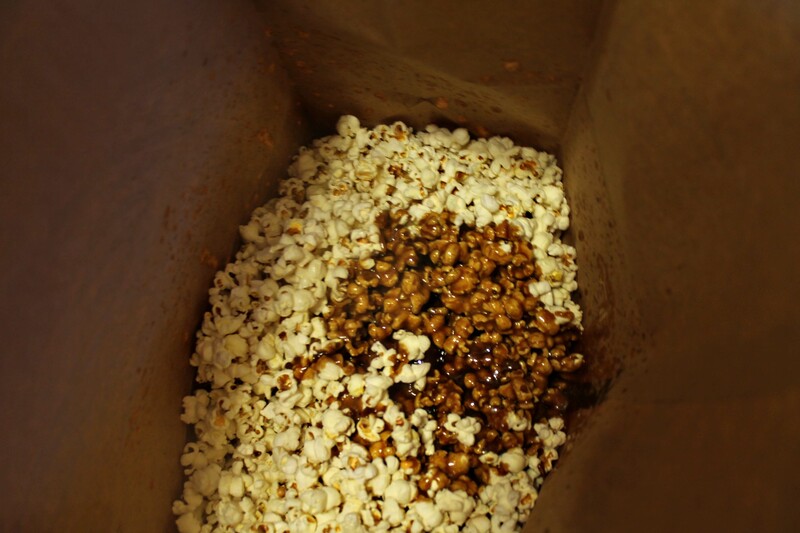 This coats the popcorn in the caramel sauce. You can feel the caramel corn being coated as it gets heavier than the uncoated popcorn. 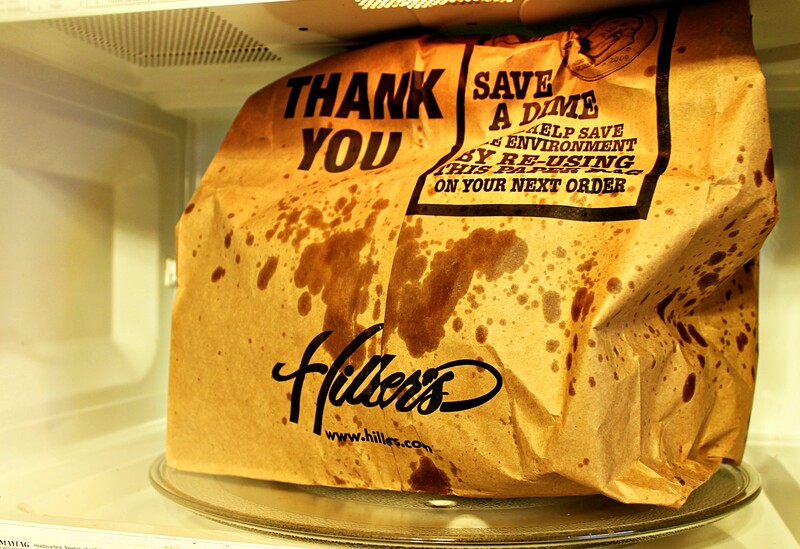 After shaking the bag, return it to the microwave for 45 seconds. Then take the bag out and shake it again. 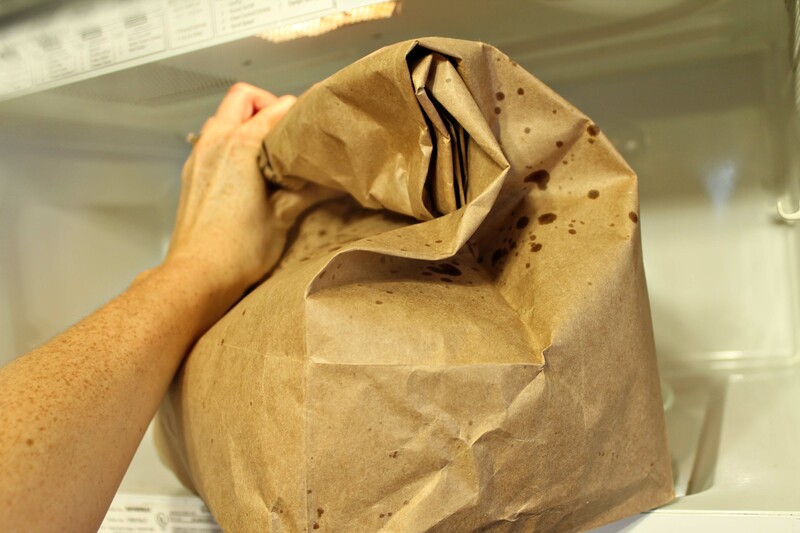 Return the brown bag to the microwave for 20 seconds and give it a few more shakes. If you want to add nuts to your caramel corn throw some in and give the bag one more shake. Your Microwave Caramel Corn is ready. 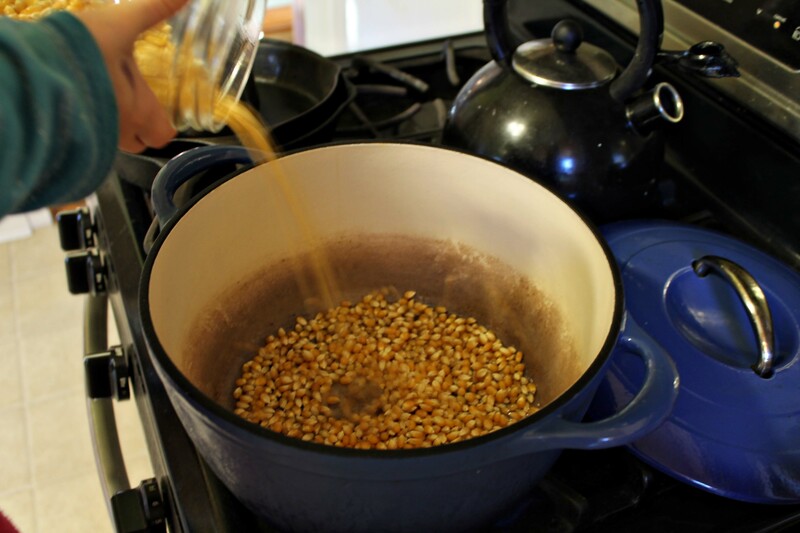 Dump the Caramel Corn into a dish (or onto a cookie sheet) to cool. Serve and devour. 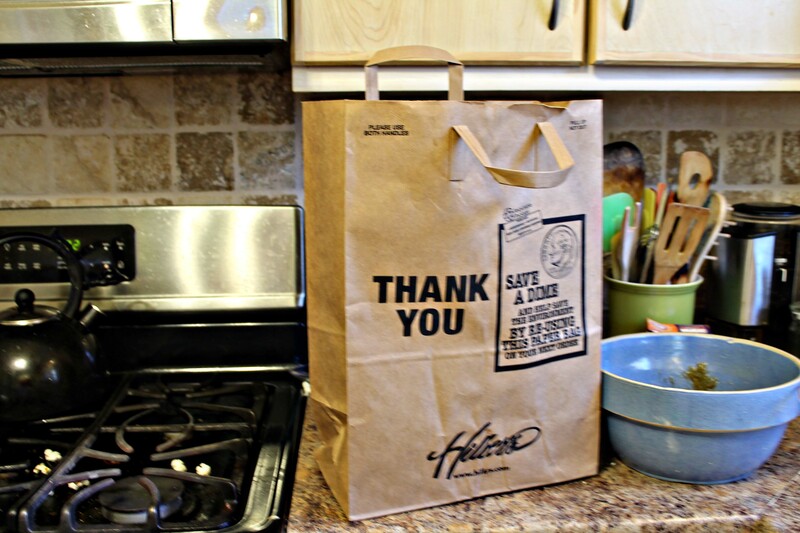 The great thing about this recipe is throwing away the brown paper bag with all the mess. You really have only a pot (popcorn), and bowl (caramel corn), and a spoon to clean. And not having many dishes to clean is a reason to celebrate my friends. Thanks so much Paul and Ruth for the fun filled evening. My kiddos are still talking about it and wear their sweat shirts daily! P.S. 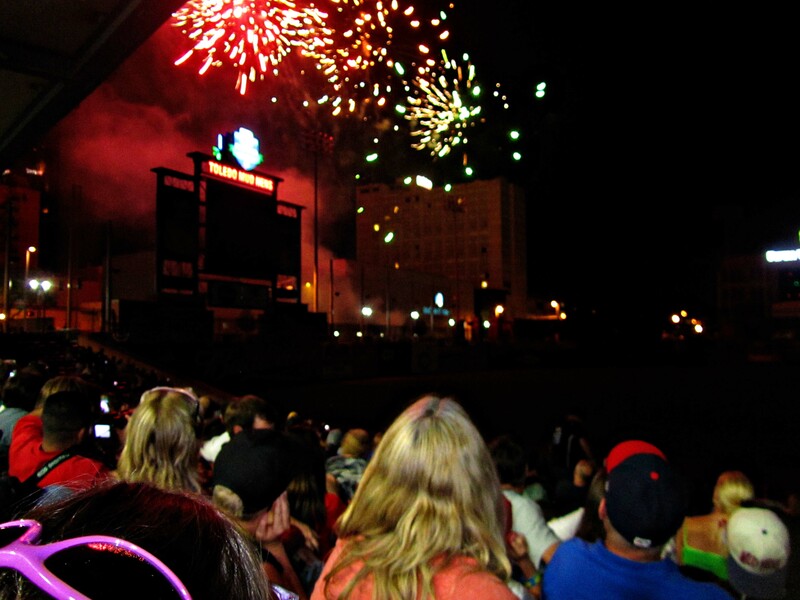 If you think baseball hasn’t affected you, read some of the baseball jargon you probably use in your everyday speech. And “right off the bat,” a few of those terms (just a “ballpark figure”) spring to mind. And if that list doesn’t convince you that baseball IS America, check out this list of baseball derived phrases we all use. 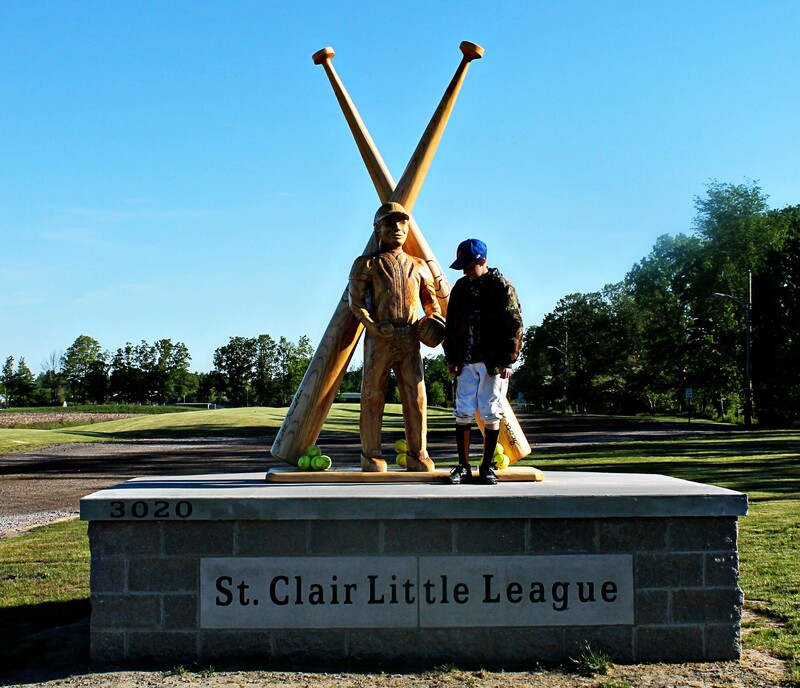 This entry was posted in She said... and tagged baseball food, baseball jargon, baseball quotes, baseball sayings, litle league, tony packos, ypsi nationals little league. Bookmark the permalink. 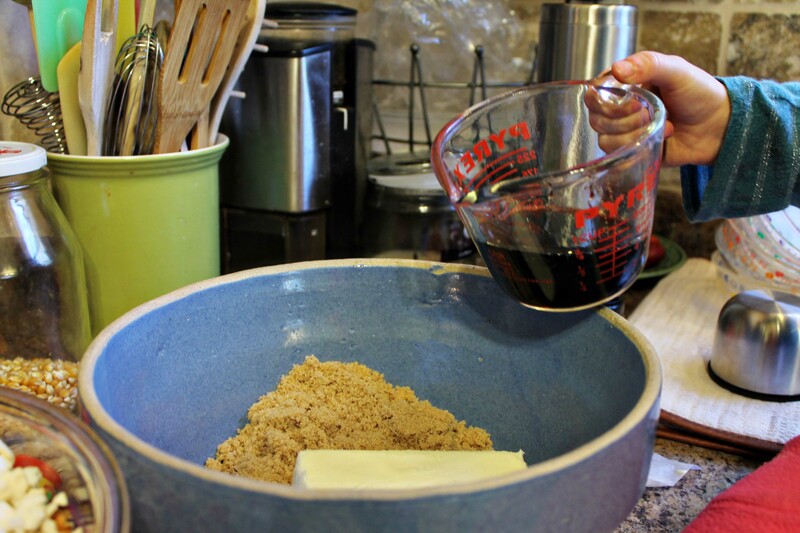 I love that popcorn recipe I tried making crunchie bars once and it was a similar recipe – total disaster though i could always taste the bicarb soda. Im watching cricket at the moment – it makes baseball look like a fast paced game – and one match goes on for 5 days. I enjoyed all of the baseball vocabulary—I had no idea there were nearly as many phrases to learn as cricket. Thanks for the tips on caramel corn, and I also thought that I would mention that for some reason typepad is marking every other comment that you leave on my blog as “spam.” I have no idea why–I just recently started checking the spam folder, and found some of my own comments in there!! I do apologize if I have missed some of yours in the past. 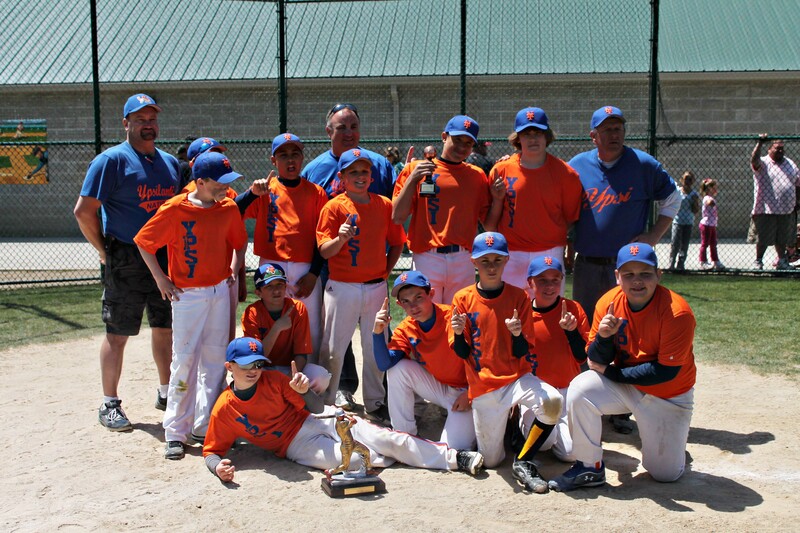 Great baseball post! I’m going to have Steve read it. Although, I am BASEBALLED OUT!! It’s not been an easy year politic-wise. Why oh why do grown-ups have to ruin it??!! I believe we only have 1 or 2 more tournaments and we’re over. I may stay home for those on account of stubbornness. 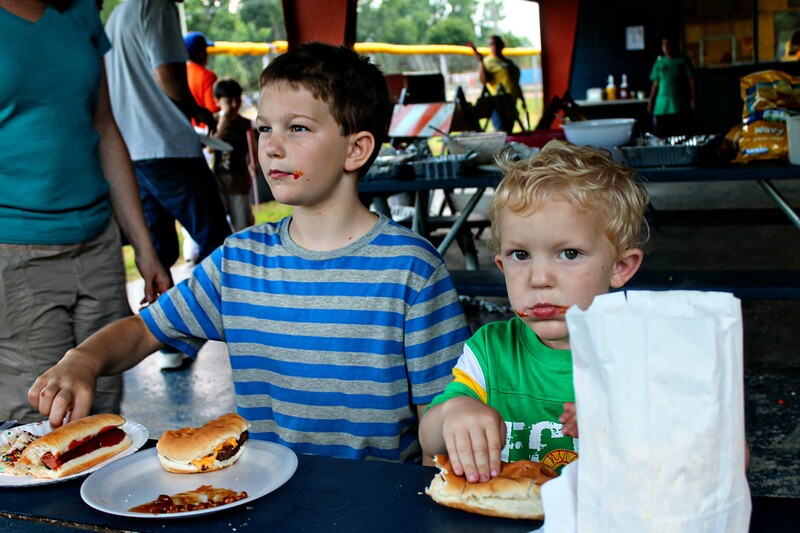 Anyway, I sure do love those two boys pictured second eating hotdogs. We miss them!! 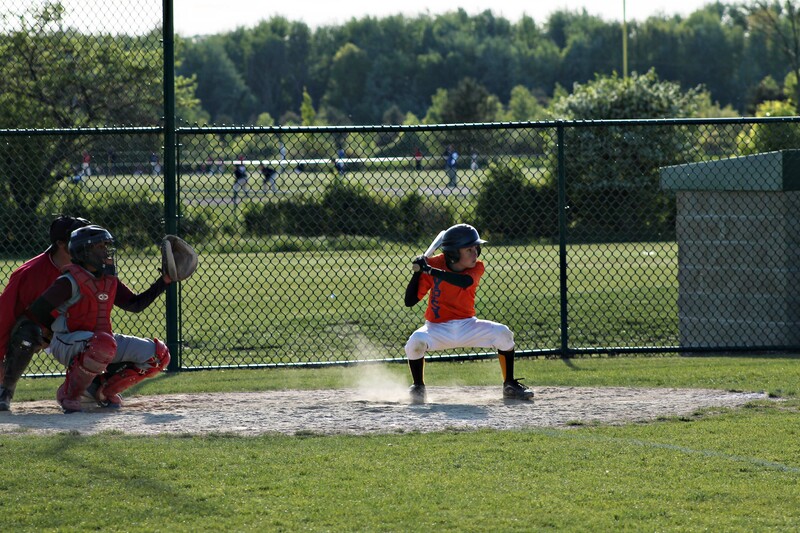 Love Little Man pitching to Baseball Boy! 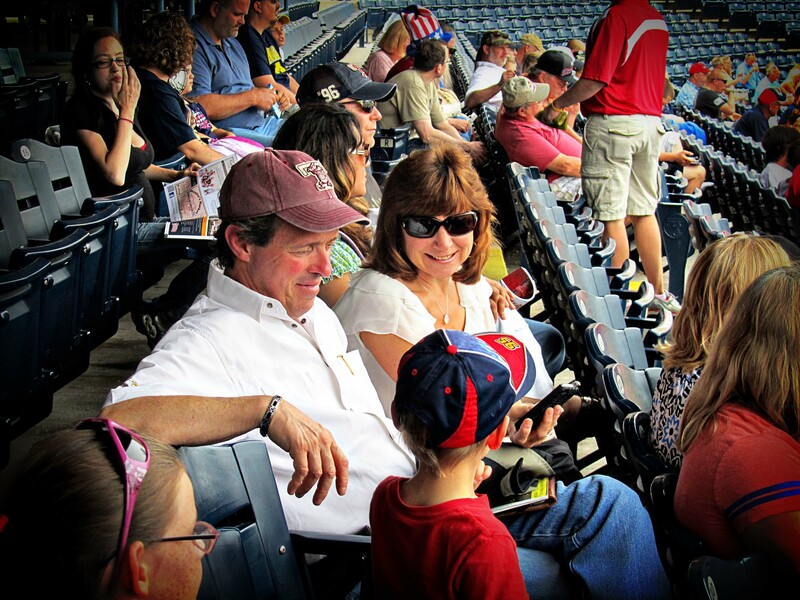 Thanks for taking us to the Mudhens! A little late, but we sure did enjoy this! Thank you so much for the shout-out! 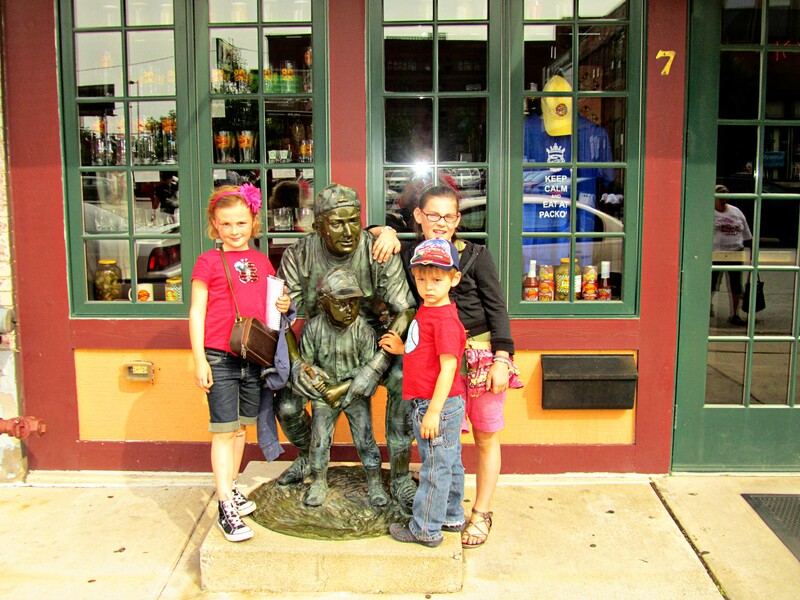 And please try our Tony Packo’s popcorn and let us know what you think!